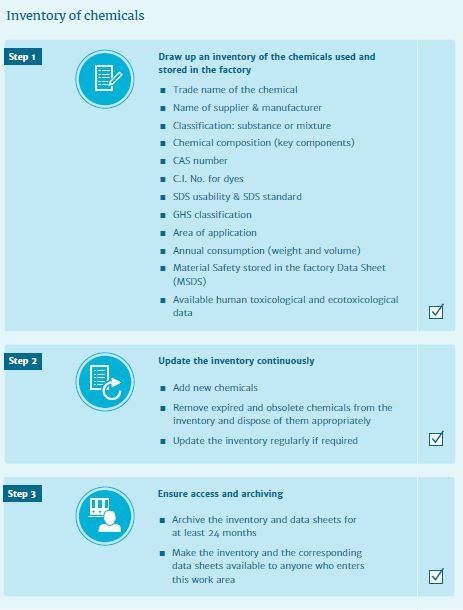 Keeping an inventory of the chemicals used and stored in factories is necessary in order to keep track of what chemicals with human- and ecotoxicological characteristics are used, be able to conduct risk assessments, prevent unnecessary keeping of stocks, and to provide employees and, where relevant, operatives with information about the chemical hazards. For effective chemical management, it is necessary to clearly identify what chemicals are used, how they should be used, and what substitutes can be used in their place. This requires that established inventories are continuously updated and archived.